You’ve aced every group project (or at least passed), explored and absorbed countless clinical diagnoses and principles, and then shockingly passed your cadaver lab without fainting (that’s a lie, I actually joined the ranks of the fainthearted). What’s next on the journey? The best part of our educational experience: level II Fieldwork! The pressure, novelty, and exhaustion you experience while participating in Fieldwork can sometimes feel like you are taking an 8-hour test every day of the week, but Fieldwork is truly the time I learned the most about the profession of OT, and when I grew not only as a clinician but also as an individual. My level II Fieldwork at an acute psychiatric inpatient unit was exhilarating, impactful, uncomfortable, intuitive, and for lack of a more appropriate term, just “heavy.” I was placed for 12 weeks at a locked-in unit with an adult population experiencing severe depression, anxiety, schizophrenia, substance use, eating disorders, personality disorders and much more. While we are educated in the classroom about many mental health conditions and related treatments, it cannot adequately prepare us for the actual experience of being exposed to people expressing their homicidal/suicidal ideations, hallucinations, paranoia, anxiety, depression, and uncontrollable behaviors, and how these illnesses are affecting their lives. This can be overwhelming and emotionally challenging. As naive as it may be, I believed there was an expectation for us, as aspiring students in the field of OT, to have strong and resilient mental health. After all, we are ambassadors carrying the message of self-care, coping skills, stress management, etc. to others. However, the busier and more stressed students become as they navigate this novel journey of fieldwork, the easier it is for them to forget to utilize the evidence-based strategies they’ve mastered in the classroom. A study conducted by Adamson et al. (1998) found that new graduates felt that they were poorly equipped to cope in the workplace and recommended that topics related to stress and burnout be included in our academic programs. The authors argued that OTs needed to build up their personal and professional coping strategies in order to decrease the levels of negative stress while in fieldwork. By the third week of my mental health rotation, I noticed that my own mental health was suffering. I was isolating myself from social situations, frequently feeling depressed or anxious, engaging in almost no leisure activities, sleeping an excessive amount, and overall not engaging in self-care. I was emotionally engaged in the patient care and passionately focused on only them. When I noticed this lifestyle change, I reflected on why this occurred and then implemented these new and beneficial strategies in my life. I think we all know that empathy and compassion for our patients is vital in our field and our future careers; however, can we become overly empathic with patients? This answer is, yes! My first several weeks witnessing the reality of a mental health setting was distressing. I was somehow surprised, or perhaps unprepared, to understand the severe and overpowering effects of mental health disorders on an individual and saw how it drove many to a point of helplessness and hopelessness. The empathy I felt towards my clients started affecting my mood, clinical decisions, and interactions in and out of work. The valuable lesson I learned is that there has to be a balance between empathy and objectivity, otherwise, you are really misleading your professional reasoning and overall doing injustice to the patients. An intriguing article by Rose Zimering (2003), discussed the correlation between mental health care providers and secondary traumatization, which is defined as “indirect exposure to trauma through a firsthand account or narrative of a traumatic event.” The number one recommended solution to secondary traumatization is maintaining awareness of it. Being conscious of your emotional reactions and using personal coping skills with that awareness can be effective. I also came to the realization that the patients I was interacting with were incredibly strong, brave, and resilient people, and that’s how I needed to perceive them. Taking all these emotions and perceptions into self-motivation allowed me to find and implement the best intervention practices for them and focus on a future-oriented mindset. Focus on your emotional intelligence and equanimity, and the rest will fall into place. 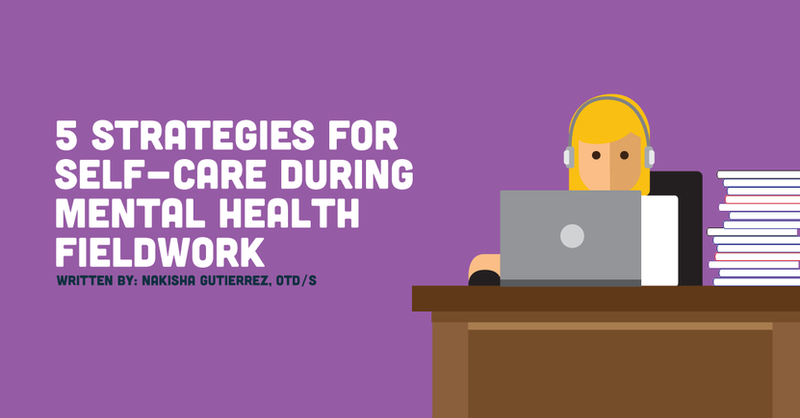 As OTs, we are heavily educated in coping skills, self-care, stress-management and more, but I was hardly ever listening to the words I was preaching to every patient until my level II Fieldwork. I frequently, and I mean frequently, utilized cognitive behavioral therapy strategies on myself during this rotation. For those of you not familiar with cognitive behavioral therapy (CBT), I suggest you research it, because I believe everyone in the world could benefit from CBT. One strategy I engaged in was journaling. In almost any Fieldwork, students are stressed and it’s so easy to focus on the daily mistakes or perceived mistakes. Instead, I encourage you to write down five positive things you did each day before going to bed (relating to Fieldwork or your own life). Research has shown huge benefits from this type of activity (Delany et al., 2015; Fritson, 2008)! Additionally, I challenged myself to do at least one self-care activity a day, which ranged from a workout class, meeting up with a friend, reading, watching my favorite show, or even just taking a different route walking home. As many studies show, exercise has a multitude of health benefits and this became my number one coping strategy (partnered with the occasional rewarding indulgence of my favorite foods). The first several weeks of my Fieldwork, I was consumed by the new atmosphere and placement. So consumed that I would go home and call peers from my class, and discuss patient care (not personal details) for the day, mostly focusing on the challenges. I was co-ruminating to the point of obsession and was thinking about my patients almost 24 hours a day. I’m sure you have heard this saying a million times but truly: leave work at work. Maintain the balance and boundaries between your work and personal life in order to avoid emotional exhaustion. In the following weeks, I would go home and dwell on the heartbreaking stories of a mother having ideations of killing her newborn, the multiple suicide attempts, substance dependency, and every other tragic story of perceived lost dreams. Don’t focus on these. Once I noticed what I was doing, I switched my tactics: if I felt that I needed to talk about work, I only spoke of the positive and uplifting occurrences. Obviously, you can share the occasional boisterous talk of a positive breakthrough a patient had at fieldwork with friends after work. This is not only good for yourself but such a motivator for peers. We are here to make a difference and we are. That is the focus and the message that needs to be shared. Initially, I was incredibly unsure about reaching out to my clinical instructor or even my mentors and advisors from school about the difficulties I faced with Fieldwork. I wanted to be perceived as a fearless, strong, independent student that was handling Fieldwork challenges with a breeze. After week three, I realized I needed interaction and thoughtful discussion with those around me and at work who had the experience and expertise to guide and assist me. I put aside my fear of judgment and ventured to ask a simple question to my CI, “Have any previous students had a hard time acclimating to this emotionally stressful environment?” This led to the floodgates opening and changing our relationship for the better. From then on, my CI continually checked in with me, offered breaks to me after intense interviews or moments with patients, and overall was incredibly supportive. I think the best decision I made during this Fieldwork was to communicate with my Fieldwork educator in an open and honest manner. He not only provided further emotional support but also gave me some of the useful advice and tips that I’m sharing on this blog. When doing this, make sure you set up a time in advance and don’t just blurt it out right before you start an important session. The best advice I can offer you is to remember why you are there and focus on the positive impact you are making. Patients, in general, may be experiencing a situation or circumstance where they are feeling disheartened and hopeless. Be their encourager and help them find hope; hope for returning to their desired lives and dreams, passions, and routines. As OTs, we help individuals reach their personal goals, accomplishments, and make changes to better their lives. Take pride and motivation in what you can do as an OT and utilize those skills. You witness moments of accomplishments and will share in the triumph. This was what made every day on my level II Fieldwork remarkable, and I’ll remember the expressions and gratitude patients had when reaching their personal goals. By the end of my rotation, I not only understood my mental health more but also became a more competent and composed clinician. Managing your own mental health and self-care in any setting or workplace is vital in the prevention of burnout and compassion fatigue. Recognizing those red or pink flags (isolation, changes in sleep, mood, appetite, relationship/social changes, etc.) and reflecting on and engaging in changes that need to occur to thwart them is critical. Finally, I encourage you to rest when you are tired, recognize and celebrate the wins, learn from the mistakes, never let go of compassion and know that our education and Fieldwork experience has prepared us and empowered us to succeed in this field. These are the tools and approaches that I utilized but clearly, it is important to continually seek opportunities and solutions that work for each of us. I welcome others to share their strategies used to help maintain their own mental health and motivation during Fieldwork. Share with us in the comments below!